I generally start a blog post with an idea for a story from my family history, my reading or something I've seen on television. I hardly ever have a plan and often I use the process of writing about my family history to help me identify what I know and what I don't know about a family. Those are the posts I tag as 'Research Methods' because I write about the places I have looked, the searches I have done and what I have or haven't found. They do tend to be a bit long and rambling, but I hope you find them useful. However every now and then I write for an hour or so and realise I haven't told the story I started off with. Rather than continue rambling on I will finish the post saying that a sequel is likely. And I might I nip back to the beginning of the post and edit the introductory paragraph to make more sense, given what I have actually written! The last post I published was one of those instances - I began to write about Private John William Kilner from Chapeltown and then realised that I needed more time to explain his family. At the end of the that post I mentioned that I had found a picture online of the White Horse Hotel where he and his family lived in Chapeltown. I have now been given permission to use the photo on my blog (my thanks to Christine at the Ecclesfield District Archive for helping me with this). The White Horse Hotel is the low building nearest to the railway bridge. It has the look of railway offices or related buildings, I am not a railway historian, but from its position I imagine it must post date the railway line as it is too close to have been built around. 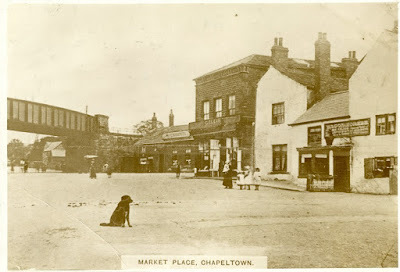 If you are at all familiar with Chapeltown you will know that the Wagon and Horses, the white painted building on the right of the picture above, is now a Wetherspoons pub and is a much larger, probably early 20th century, building. Between that pub and the railway bridge there are modern shop units backing onto ASDA, dating from the 1970s or 80s I guess. The market place is now a large busy roundabout and road traffic signs block the view whichever way you look. The Kilner family have close links to two pubs in the Chapeltown and High Green area. In 1851 the great grandfather of my soldier was a butcher and inn keeper at High Green. William Kilner (b.1806) was listed as a butcher only in 1841 so running a pub was a new business for him. By 1861 the pub is being run by his son James Kilner (b.1833) and it has a name, the White Hart Inn. I found an interesting account in the Sheffield Independent dated 30 March 1861. It seems that William became bankrupt in 1860, but had managed to transfer his property to James some years before the declaration of the bankruptcy. The authorities were taking a very dim view of this and were trying to work out if it had been a legal transfer or not. I was able to find the White Hart Inn on an old map on the National Library of Scotland website. The area is very rural with more housing in Mortomley than High Green. Sadly a Google search of the area now suggests that housing has covered the place where the White Hart once stood. A photo in the Picture Sheffield collection shows a modern style pub called the White Hart at 101 Wortley Road in the 1970s or 80s. James Kilner remains at the White Hart Inn in 1871, his children now include William aged 7 (b.1864). William plans to becomes a butcher like his father and grandfather and in 1881 he is living and working as an apprentice with his uncle John Kilner (b.1819) in Wortley. John is the local butcher, grocer, draper and runs the post office, he employes two men and 3 boys, including William. Family history is a like a jigsaw puzzle, why would William be living with his uncle in 1881, why not learning his trade from his father James in High Green? Well, sadly, James had passed away, aged just 45. I was able to find the index to his Probate record on Ancestry. "18 November 1878 - The Will of James Kilner late of High Green in the Parish of Ecclesfield in the County of York Licensed Victualler who ided 6 October 1878 at High Green was proved at Wakefield by William Kilner of Wortley in the said County Butcher and Grocer and William Hague of High Green Cordwainer the Executors." His widow Sarah is still living in High Green in one of a set of sixteen houses called 'Kilners Houses' in the census of 1881. She is living on her own means in 1891 suggesting a pension or investments that are giving her enough to live on. There are also groups listed on the 1881 census in High Green called Darwins Houses, Chambers Houses, Briggs Houses, Bamforths Houses and many more, suggesting a lot of locally funded building had been carried out in the area in the past few years. Many of the houses are lived in by coal miners. We can't see the names of the rows in the map snip above from 1894 but we can see how many more houses there are compared to 1855. If James Kilner had invested in providing houses for the men coming to work in the new mines that would have given the family some financial security and provided Sarah with money to live on after James' early death. On 5 April 1891 William Kilner, the young butcher, last seen living with his uncle in Wortley, marries Mary Savage, daughter of John Savage, Inn Keeper, in St Mary's church in Barnsley. In 1871 John Savage had been the Market Toll Collector in Barnsley, following the family tradition of service to the borough. Oddly in 1891 he is the landlord of the White Hart in High Green! I haven't a clue (yet!) what is going on in John Savage's life. He is still, apparently, married but not living with his wife. There is a widowed housekeeper and four other servants in the pub including three 'Professional Pianists'. The only family member living with him is his grandson Percival Savage aged 9. Note to self: revisit this family sometime. So I don't know how William met Mary, maybe when her father took on the White Hart, maybe during the course of his work as a butcher he moved to Barnsley. They both give Doncaster Road in Barnsley as their address, but that could have been the address of a relative (probably that of her brother William Savage the assistant Sanitary Inspector) for the sake of convenience for the marriage. By 1901 William and Mary Kilner are settled in the White Horse Hotel in Market Place, Chapeltown. They have two children, John William aged 8, who becomes our soldier, and Annie aged 5. There are also two servants in the house. The family are still in the pub in 1911 and as we know, still there in 1915 when John's death is reported in the Barnsley Chronicle (see previous post). I left this post in draft form for several days, but now I've decided to post it anyway. I think I've answered my own questions about how the Savages and the Kilners interact and the information about the pubs in Chapeltown was interesting, if incidental. My thanks again to the Chapeltown & High Green Archive for permission to use the White Horse Hotel image. Back to my WW1 soldiers, lots to do and never enough time to do it!